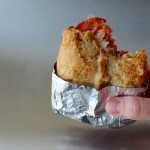 Warm, crusty, gooey, cheesy low carb hot pockets! Prepare one pie shell following instructions on the package of LC-Pie Crust Mix. Roll out dough into a square/rectangle shape. Using a pizza cutter, cut 2-4 rectangles out of the dough, re-rolling the scraps as needed. Place pepperoni and cheese in the middle and fold edges in, crimping to form a seal. Bake on parchment lined baking sheet for 10-15 minutes, checking occasionally. They may be greasy from the pepperoni, so watch that they don't burn. You can use any meat and cheese combo you like! Thanks to keto.luna on Instagram for the recipe idea!